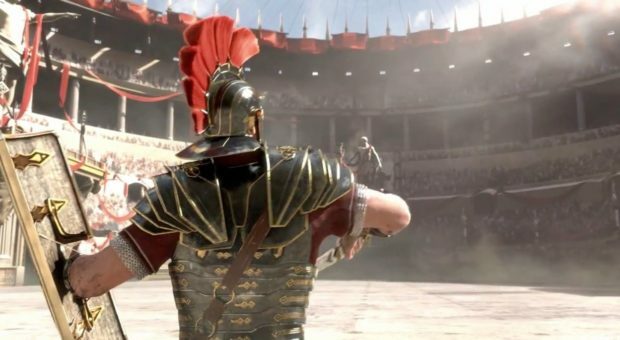 Ryse: Son of Rome features a total of 58 Achievements worth 1,000 Gamerscore. Out of these 58 Achievements, 46 Achievements are offline and 12 are online. Before you embark on your journey on getting 1,000 Gamerscore, you need to jump right into the single-player campaign. As for the other Achievements, refer to the guide below and do not forget to share your own tips and strategies with us! This is pretty easy to earn and you just need to press RT whenever you see a skull over an enemy’s head. This one is a little bit harder than the Head Executioner but you will be able to pull it off with practice. Attack an enemy until you see a skull over his head and immediately start attacking other nearby enemy until you see skull on both of these enemies. Now, get near them and press RT to perform a double execution. Earning this can be a bit frustrating especially when you are in a tight camera spot as there are no attack indicators. Prior to doing this, I would advice you to have your damage boosted up to the max! The easiest way I found to do this is to start S.P.Q.R. on easiest difficulty setting and start taking out enemies in the open areas. You will also have an ally with you at all times which makes this a bit easier. You can also check out EnemyBritBomber’s YouTube Demonstration in which he talks about an entirely different technique. Earning this Achievement will also net you ‘Comboing My Way Through’ for 10 Gamerscore. While playing ‘The Beginning’ on any difficulty, when you first come to the bridge, try and maneuver an enemy soldier up a railing or a hole and keep on attacking him until you see a red skull on his head. Execute him for 5 Gamerscore! This can also be earned during ‘The Beginning’. Just perform your first execution while on the bridge. This is as simple as it sounds! But getting all execution and upgrades is not an easy task. Getting all these upgrades and execution will cost you about 2 million Valor. The best of earning this much is by playing the first chapter on Recruit difficulty setting until you get your desired amount of Valor. After getting enough Valor for your first upgrade, you will get a notification on the screen. Simply, buy an upgrade and get back to a fight and pop goes the 10 Gamerscore. Just like Deja Vu from Assassin’s Creed II. Simply replay any mission on any difficulty setting and you will unlock it at the beginning of the mission. The following Achievements are unlocked by collecting the all the collectibles in the game. Worry not! We have a separate guides on Ryse: Son of Rome Vistas, Scrolls, and Chronicles. Self-explanatory! This can be done both in solo or co-op mode. In the multiplayer matches, you will have the option of choosing a god from a total of four. All of these gods have their specific rewards which are unlocked after completing a certain number of matches with them. After you have unlocked your first reward with a god, the Achievement will pop-up. Once you have unlocked all rewards with all four gods (Jupiter, Mars, Apollo, and Diana), the Achievement will pop-up. There is not much skills involved in getting this as it does not matter whether you win or lose. There are a total of 10 MP environments. After completing an environment, you will have the ability of choosing your next environment. Play them all to unlock it! To earn this Achievement, you need to complete 20 Arena matches. Gold which is used to buy rare items can be bought from Xbox Live Marketplace or by playing matches. Once you have enough Gold, purchase a rare item and go play a match to unlock this. The bronze pack which has the minimum value costs you about 2,000 Gold. In addition to this, you need to be Level 89 to unlock it. After you have bought the item, get to a match and you will unlock the Achievement. Reviving should not be alien to any gamer out there! In a co-op match, revive your teammate three times to unlock this. Simple as it can be! Get 100 kills in Arena match and you will unlock it. By now, you must be familiar with executions. While you are playing the co-op mode, keep on attacking an enemy until you see the execution skull over his head. Make sure to keep your partner near you, if done successfully, you and your partner will see a slightly enlarged skull. Perform the execution and you will be done! Tier 2 are unlocked at level 4. The cheapest of which cost you about about 600 Gold. Once you have bought have it, get in a match and pop goes the Achievement. At the very end of ‘The Beginner’, you will encounter fire wielding Barbarians. Once these Barbarians erupt fire, use your shields to shove one of them into his own fire and start attacking him until you see the execution skull over his head. Perform the execution and you will unlock the Achievement. This Achievement requires you to parry an incoming arrow. However, it is not as simple as it sounds and you will need strict timing to get it. Note that, it might get you a few tries before getting hold of it. You can do this with any archers but the archers in Chapter #7 near the shore make it pretty easy. You need to make sure that you parry the arrows coming from the ground archers – the aerial ones will not work. Once you have done this successfully, the Achievement will pop-up. Multiplayer Arenas gives room to different traps which can be used to earn this Achievement. While you are playing one, simply activate a trap and try to push an enemy into it. Yes, that is very important! You need to push an enemy into it to get it. I will not beat around the bush and come straight to the point! Start a game with one of your friend and set the environment to Classic Rome. Take Jupiter as your own god as it will help you gain maximum amount of XP in no time and ask your friend to opt for Apollo. Performing executions is a great way of giving your character some breathing room. Archers are a great threat to your XP farming. Before engaging in a combat, make sure to take out the archers first. And even if you cannot do it, do not forget to deflect the arrows. Use your Focus carefully! Keep in contact with your friend and know when to attack to take out the heavy enemies. Do not slash in air; this will break your combo. So avoid hitting in the direction where you will not find any enemies. Keep on repeating this process unless you get to your desired XP level. These aren’t the only ways you can earn these achievements, you may come up with a better way and when you do, roll with it.